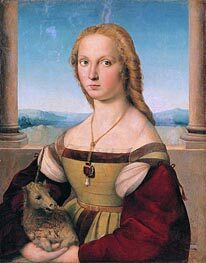 Raphael or Raffaello (Urbino, Italy, April 6, 1483 - Rome, April 6, 1520) was a master painter and architect of the Florentine school in the Italian High Renaissance, celebrated for the perfection and softness of his paintings. 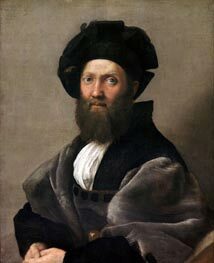 He was also called Raffaello Sanzio, Raffaello Santi, Raffaello de Urbino or Rafael Sanzio de Urbino. 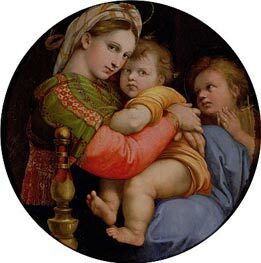 Raphael was born the son of Giovanni Santi and Màgia di Battista Ciarla, who died in 1491. 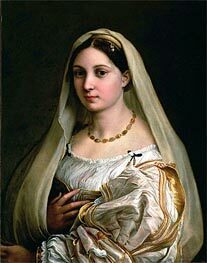 His father was a poet and a painter for the court of Mantua, and at the time of Raphael's birth, he was the head of a well known studio in Urbino. 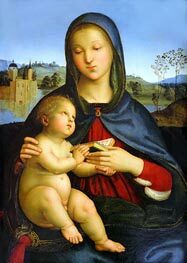 Giovanni instructed his son in painting and introduced him to the humanist court of Urbino, which at the end of the 15th century, was one of the most active cultural centres in Italy under the rule of Federico da Montefeltro, who had died seven months before Raphael's birth. 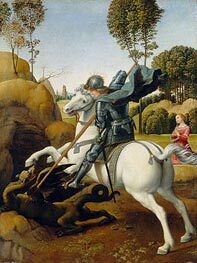 There, Raphael could have encountered the works of Paolo Uccello, Luca Signorelli, and Melozzo da Forlì. 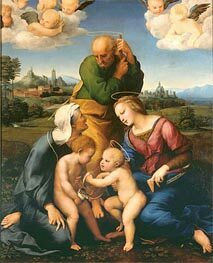 Raphael showed an early talent, and by age 17, 1500, he was defined a "master". 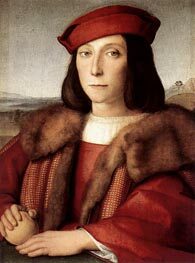 In his biography of Raphael, Giorgio Vasari maintains that Raphael's father took the 11-year-old Raphael to Perugia to be apprenticed to Pietro Perugino. This is disputed by some authorities, although it is generally agreed that Raphael was in the Umbrian city from 1492, the year after his father died. 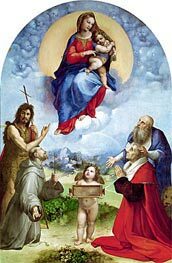 The first documented work by Raphael is an altarpiece for the church of San Nicola da Tolentino in Città di Castello, a town midway between Perugia and Urbino. The piece was commissioned in 1500 and completed in 1501. It was damaged by an earthquake in 1789, and today only fragments remain in the Pinacoteca Tosio Martenigo of Brescia. Another important early commission was the Crowning of the Virgin for the Oddi Chapel in the church of San Francesco in Perugia. Raphael, probably as a member of Perugino's workshop, also worked on the frescoes of Collegio del Cambio. The Marriage of the Virgin (1504) is the main work of this period, inspired by Perugino's Giving of the Keys to St. Peter of 1481-1482. 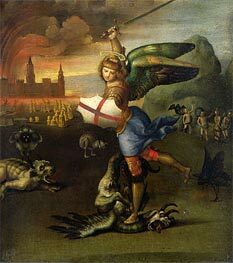 Shortly after which he completed three small paintings, Vision of a Knight, Three Graces and St. Michael all showing the great maturity and freshness typical of his style. In 1504 Raphael moved to Siena with the painter Pinturicchio, whom he had supplied with designs and drawings for the frescoes in the Libreria Piccolomini in Siena; and then to Florence, led by the more reasonable rule of gonfaloniere Pier Soderini after the excesses of Savonarola's years, and where two great masters, Leonardo da Vinci and Michelangelo, were at work. 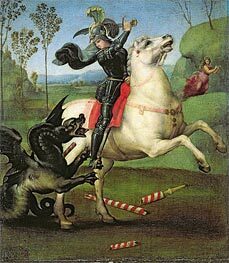 Raphael's presence in Florence from autumn 1504 on is confirmed. There he lived for the following four years, even though he may have travelled to Perugia, Urbino and maybe Rome. In 1507 he was commissioned by a Perugian noblewoman to paint the notable Deposition (Galleria Borghese, Rome). 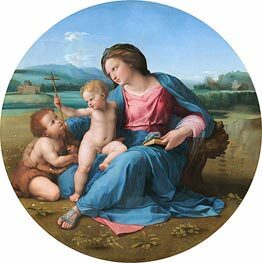 In Florence, Raphael befriended several local painters, notably Fra Bartolomeo, a proponent of the idealistic principles of the High Renaissance; the influence of the latter pushed him to abandon the thin and graceful style of Perugino and embrace more grandiose and powerful forms. 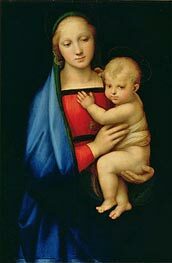 However, the strongest influence on Raphael's works of the Florentine period came from Leonardo da Vinci's compositions, figure placements and gestures, as well as the innovative techniques, (chiaroscuro and sfumato). 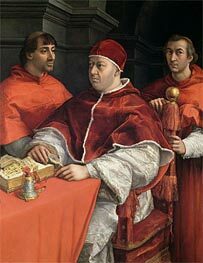 Toward the end of 1508, Pope Julius II, advised by Raphael's townsman Donato Bramante, commissioned his services in Rome. 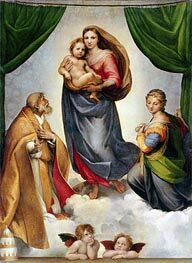 At that time Raphael was a 25 year old painter still forging his style; soon, however, he gained popular fame and the favor of the Pope. He was earning the nickname of "prince of painters." 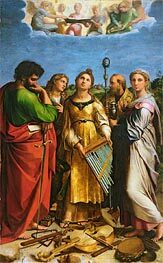 In the following 12 years Raphael never left what became his second mother country, working mainly for Julius and his successor Pope Leo X (son of Lorenzo de Medici) and painting a series of masterpieces. He became the most sought-after artist in the city. At the end of 1508 he began decorating the apartments of Julius in the Vatican, which, in the pope's vision, were intended to glorify the Roman Church's power through the justification of humanism and neoplatonism. The best known of these frescoes are the Signature Room (Stanza della Segnatura), completed in 1511, with the famous Disputa and The School of Athens. 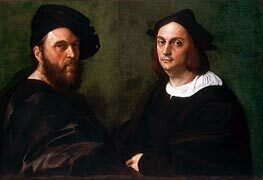 Raphael continued to work on the rooms until 1513, under the reign of Leo X, but left the last sections almost entirely to his pupils. In the meantime he worked on other tasks, such as secular and sacred decorations for various buildings, portraits, altarpieces, cartoons for tapestries, designs for dishes and stage sceneries. 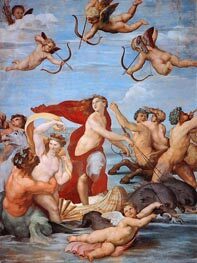 Some of the most renowned works of this period stem from his friendship with the rich Senese banker Agostino Chigi, who commissioned his beautiful fresco of Galatea in his Villa Farnesina and the Sibyls in the church of Santa Maria della Pace, along with the design and the decoration of the Chigi Chapel in the church of Santa Maria del Popolo (1513). This first architectural work earned Raphael the seat of architect of the new Saint Peter's Basilica (the construction of which began in 1506), left vacant by Bramante's death in 1514. 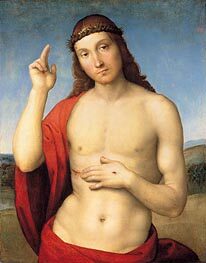 Raphael changed the plan of the work from a Greek to a longitudinal design, but the project was again modified after his death. Two years later he drew the lines of the important Villa Madama in Rome. In 1515 he was also named as a sort of supervisor for Roman archaeology research, drawing up an archaeological map of the city. 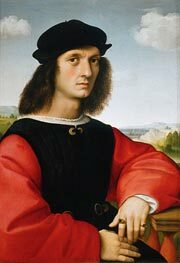 Raphael’s prestige gave his works a role in the creation and strengthening of political alliances, as in the cases of the works now in the Louvre, which were sent to the French court, and in the Portrait of Lorenzo de Medici for the Florentine party. 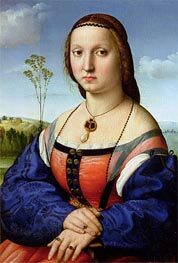 Raphael never married, even though in 1514 he was betrothed to Maria Bibbiena, niece of a cardinal, but the engagement was ended by her premature death. According to legend his greatest love was one "Fornarina" ("the little baker"), but her existence is unconfirmed. According to Vasari, Raphael's premature death was due to the "excesses of love". 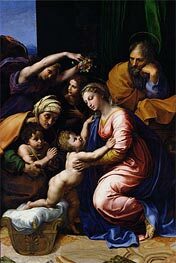 In his last years (1518-1520) the intervention of the workshop in Raphael’s works became more significant, as can been seen in works like Sicilia’s Spasimo for a church of Palermo and the Visitation now housed in the Prado of Madrid. Also, the decoration of the Constantine’s Room in the Vatican was executed entirely by his pupils based on the master’s drawings. His last autograph pictures are the Double portrait of the Louvre, the small but monumental Ezechiel's Vision and the Transfiguration. 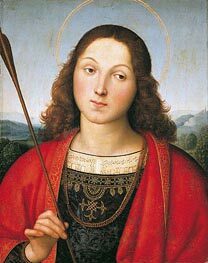 Raphael's sudden death in Rome on his 37th birthday (reportedly just weeks before Leo was to invest him as a cardinal) was deeply lamented by all who recognized his greatness. His body lay in state in one of the rooms which demonstrated his genius, and he was honoured with a public funeral. The Transfiguration was carried before him in the funeral procession. He was interred in the Pantheon, Italy's most honoured burial place.